It took me five years, from the time I first glimpsed a tiltrotator, to installing one on my excavator. The first time I saw one, I wasn’t even sure what it was or what it could do. What I could see is that it significantly increased the range of motion of an excavator, and I knew it was a game changer. 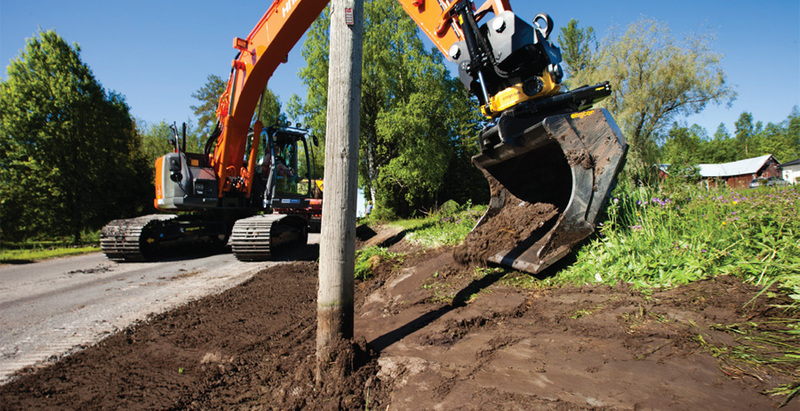 The rotating action allows you to tackle a job from many more angles often without the need to reposition the excavator. This results in less time spent on each job and less wear and tear on your equipment. In many situations the flexibility of the tiltrotator allows for working without an additional employ on the ground. A single operator can now accomplish what used to take a team of at least two. Engcon has consistently offered durable tiltrotators, many Engcon tiltrotators clock over 10,000 hours of use. Engcon has developed its own digital control system, developed an affordable EC-oil system and helped develop the integrated grab concept. While offering a durable and innovative tiltrotator, Engcon has also managed to keep the price of it’s equipment affordable. Currently twice the size of their nearest competitor, you can be sure engcon will be around for a long time. Why Should You Buy A Tiltrotator? When I purchased my first tiltrotator it was not from Engcon. The company I purchased it from basically put the unit in a box and sent it to the USA. There was no instruction, no nothing, just a good ” good luck”, but not spoken in English. I started installing the tiltrotator but had a lot of questions and problems, the company was no help. In my desperation to find someone who could help me, I discovered Engcon, and discovered that they had a dealer states side. Even though I had not purchased his tiltrotator, he still patiently took my calls and helped me get back on track. Eventually I managed to get that unit working properly. From that frustrating experience, I learned 2 important things. 1. There was no way I could recommend a tiltrotator to anyone under the circirumstances that I had experienced with that first tiltrotator. 2. Engcon had a well developed control system that had a well thought out install process that a decent mechanic could succeed with in a reasonable amount of time, and most importantly Engcon was only a quick phone call away with help. Engcon had a complete package that I could recommend to others.